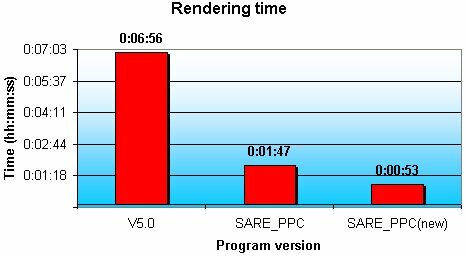 The bar chart below demonstrates the rendering speed difference between 68k and PPC systems. 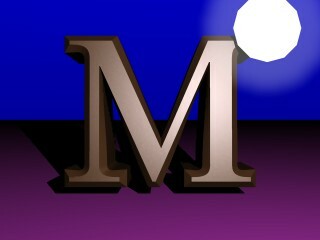 In the example "Test 1 - Global effect", a primitive disc object is placed in a scene with one light. The PPC global effect Haze is used to provide a glow/haze around the disc. Time to render frame is measured in seconds. 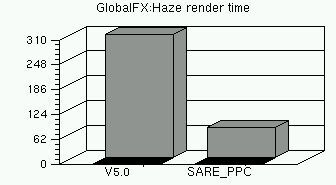 Imagine V5.0 - The final sales release version (68K renderer and 68K effect file). Rendering resolution - 640x480 24Bit.